There are a lot of electric skateboards (“eskates”) out there, but none as interesting to look at as the Zboard. This eskate simply stands out, looking both futuristic, rustic and like a mini monster truck at the same time. Quite the combination. The company behind this board boldly claims it to be the most advanced electric skateboard ever, but is it really? In today’s review, I’ll be picking apart the Zboard 2, looking at it’s best and worst features and seeing if it can really live up to the bold claim of being the best. It uses weight sensors to accelerate and slow down instead of a traditional remote control. The more you lean, the faster you go. This board came about due to the success of its Kickstarter and Indiegogo campaign. People were extremely excited and interested in it, that they managed to raise over $1,000,000. Which is crazy right!? Whats crazier is that their original goal was to only raise about $10,000. The board must be good if people were willing to put down so much money for it. 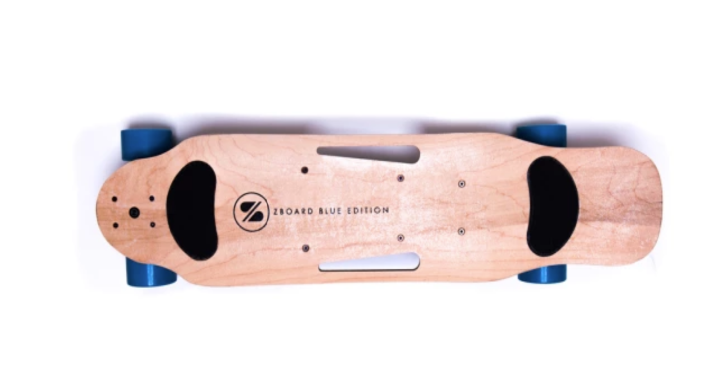 What makes the zboard 2 blue unique is that it uses weight sensors to accelerate and slow down. You simply step on a pad on the front part of the board to go forward and then on the pad in the back to slow down. Personally, I think the weight sensors are a great idea, especially for beginners. Firstly, you get to keep your hands free and you don’t have to worry about a small remote that you could lose. Secondly, it helps you balance better on the skateboard. If you are leaning forward to accelerate, it’s beneficial to you and helps you stay stable as you get to that 20mph top speed. Speed wobbles typically come from having too much weight on your back foot and by leaning forward you focus most of that weight forward. Not everyone will like the weight pads though. You have to shift your feet about to use them and that can get annoying for some. This eskate is easily faster than other boards like the Maxfind dual motor for example. The Maxfind uses two motors and only has a top speed of 17mph. The ZBoard 2 goes 3mph faster on a single motor! (Also, please get a skateboard helmet for when you skate at those fast speeds). The use of a single brushless motor not only makes the overall weight of the board less but also means it will be easy to push once the battery dies. Brushless motors don’t resist any pushing force when they aren’t engaged, unlike belt motors which do. The battery holds a lot of charge and takes you pretty far. Comparatively, you have an eskate like the Boosted Board which is more expensive but doesn’t take you very far (only 14miles with the extended battery option) and takes you just as fast (only 2mph faster). The Zboard’s 16 mile range is more than adequate for most people and even if you’re skating really far, the fast 90min charging time won’t keep you for long if the battery dies. Other eskates take far longer to charge, with a board like the Falcon 1200w taking 2hrs. The big 90mm wheels are perfect for commuting and cruising. Their tall size allows them really smoothen the ride over any surface, which is an important factor for day to day riding. This also means they can go over pebbles, cracks and other random things in the road without throwing you off your board. They also have a large core which helps stiffen and lighten up the wheel for faster acceleration. Other electric skateboards like the Benchweel, only have 80mm tall wheels. Those will accelerate better but won’t have as smooth of a ride. The deck itself is pretty wide and long. The 10in width makes it really comfortable to stand on and gives you a lot of room to shift your feet. This means it will feel natural to skate and your feet will have a wide platform to balance on. Easy for beginners as they start riding an e-skate. It is a bit long at 40in, but this is because it has a kicktail. The kicktail is great for picking the board up and for tic tacing to make tight turns. The length also allows for it to have a large wheelbase. A large wheelbase makes it stable at faster speeds, but this means you’ll lose some maneuverability at slower speeds. The deck has a nice wood grain finish and handles built in so you can comfortably carry it around. Finally, the board has reverse kingpin trucks. These trucks will be turny but remain stable because of the long wheelbase as you go fast. A good tip for beginners is to tighten the back truck if they want to be able to go fast from the get go or simply want extra stability. No beating around the bush, this is a premium electric skateboard and it shows in the price. I think it’s worth it because you pay for high-quality manufacturing and materials (no Chinese products like a lot of cheaper eskates). However, not everyone has deep enough pockets to buy this board and there are great boards like the Falcon 1200w or Maxfind that are more affordable (though not as good). But yeah, those on a tighter budget should check out my list of 300 dollar electric skateboards for something more affordable. Is this Zeee board for you? All things considered, this is a pretty great beginner friendly electric skateboard. I can say that in 2015 it was the most advanced electric skateboard, but now it features are pretty common. That being said they are still pretty good. It is a bit on the pricey side, but the quality and reliable parts are cheaper in the long run. You won’t have to replace them often, if at all. Hopefully, Zboard will update their line with a Zboard 3 shortly so I can make more bad puns haha.